← Can YOU afford NOT to do it? This great technology should not solely be looked at for the use of regulatory compliance. The focus should also include personal safety as well as loss of property. It should not be looked at as “I have to do it” but “I need it done to provide the safest work place for my people” and also provide a level of protection for your property. Over the past 18 months I have been requested by a couple of clients to attend an onsite incident investigation which in one case was unfortunately an employee had been fatally injured and in the other other very seriously burned and required extraction by Air Ambulance to the nearest major burn unit. In both cases very quickly we were able to identify and locate the sources of the leaks. Both would have been very easily repaired with very minimal down time. Both OHS and the Regulatory Board were very interested to see this technology used for this purpose, instead of the just the traditional intent of it. These experiences were very eye opening to me as to what occurs during an incident investigation. Not only will one employee never be around to see his family grow up and go on to lead fulfilling lives, the other one will never be the same and will never forget that day I am sure. 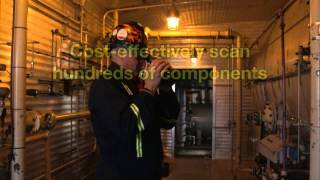 in comparison to have a GasFind IR inspection performed would not equal even 1% of the costs that have occurred since then, not to mention the personal suffering that has occurred. GasFind IR should start being looked at as a safety inspection first and by doing this it would also accomplish the original task of regulatory compliance at the same time. Heat Seeking Thermal Imaging LTD. This entry was posted in Company News and tagged ERCB, GasFind IR, OHS, Regulatory Board, regulatory compliance, safest work place, safety inspection. Bookmark the permalink.